This sauce is the perfect accompagnement with roast meat, especially lamb. It is a great way to use up all that mint growing like crazy in your garden. I like to add a stylish lable and cute lid, that way I can give away these jars as gifts. Wash your mint, pick the leaves of and chop finely. Prepare and clean your jam jars. Combine all the ingredients and bring to a simmer. Simmer for 5 minutes. Fill your jam jars, twist on the caps immediately. Place the jars upside down for 5 minutes. Turn your jelly jars every 20 minutes as they cool. This ensures the mint leaves being spread evenly through the jelly. Read more about edible gardening here. 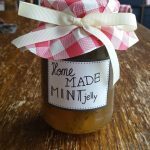 This entry was posted in Christmas and tagged jelly, meat, mint, roast, sauce by elsje. Bookmark the permalink.